What better way to discover a country than through its food? Discover Thailand and its cuisine whilst cooking your way around the country on a Tell Tale tour. You'll return with expert skills to brighten up your daily dinner table and spice up your life. Learn how to entertain effortlessly from the real experts, professionals and local housewives alike. Featured in reputable journals from the Telegraph and Food and Travel Magazine, Tell Tale Travel's cooking adventures in Thailand are rewarding for both foodies who know their way around a chopping board and novice cooks. Why make do with one Thai cooking class on a run-of-the-mill holiday, when you can do it Tell Tale style. Apart from the cooking, visit local markets, pick your own at an organic farm or feast on the catch of the day from the Andaman sea. Vegetarians and vegans can be catered for on any of our holidays. This is a private cooking tour for a couple or a pair of friends. Guaranteed to give you true authentic experiences! One on one interactions learning to cook secret family recipes in real kitchens. You'll be well looked after throughout by our unique network of local people, guides and drivers. Takes in Bangkok (city), the Central Plains (countryside), off-the-beaten-track Isan in the north east (foraging!) and finally Krabi (seafood) in Southern Thailand. The itinerary can be customised. Departures at your convenience (subject to availability). 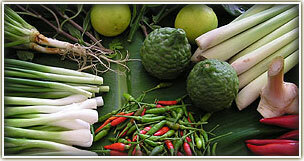 Spicy-hot small group food adventure in Thailand for those who want to travel with others. Takes in Bangkok, the Central Plains, Chiang Mai in the north and Krabi on the Andaman Coast. The same itinerary can also be taken as a private tour at other times of the year. Perfect introduction to Thailand and its food. Take in the sights and sounds of Bangkok, discover traditional Thailand in the Central Plains and explore Chiang Mai in the north including a day visit to an organic farm and relax by the pool, with Thai massage thrown in. You'll have a cooking lesson in each of the three areas. The ideal winter getaway, sun and sea in on the Andaman Coast. Desert islands, snorkelling and a couple of Southern-style sizzlingly hot cooking lessons too.